If you haven’t heard already, Startup Weekend Albuquerque is June 2nd – 4th @WESST and I am excited to be part of the central New Mexico’s new organizing team. A lot of great organizations are working together to bring a fun and impactful event that you don’t want to miss. Having organized and participated in Startup Weekends in the past, here are my 5 reasons why you should attend this 54 hour hackathon. I have consulted with hundreds of entrepreneurs, visionaries and developers about their ideas and products. Many of them never schedule nor take the time to work on their startup ideas, instead they continue to just talk about it with their friends. Don’t be that person. Startup Weekend allows you to make the time and gives you a structure to take action and see your idea come to life. Most people that are changing careers or trying to get a job know that networking is key to success. But what no one tells you is how hard it can be to make time to research and do it. At Startup Weekend, you will meet some of the leaders of the local ecosystem as well as coaches and mentors to gain wisdom. You will build new friendships and business partnerships with others participants that are taking the same steps to bring new companies and ideas into the world. Service not only looks good, it is good! These types of activities impact local industries. Participating in a hackathon is a great way to show you are engaged with your local community and care about something more than just getting a job. Employers and recruiters now look for “soul” on job applications and cover letters nowadays. So ask yourself, what are you doing to connect and contribute back to society? Probably not the main reason why you should come to Startup Weekend but having fun and getting fed all weekend already justifies the cost of ticket registration. Something else you might gain is a chance at fame. Winners at times have opportunities to move on to global competitions and get into the press. It may sound unreal but, for some, participating in a Startup Weekend can lead them on a new career path or even create a new startup company with other participants. Don’t believe me? Zapier.com and Rover.com, both leaders in their industries, are just a couple of the companies that came out of a Startup Weekend. And, Albuquerque’s very own Teeniors was launched at a Startup Weekend! If you are in ABQ or surrounding area, I encourage you to sign up for Startup Weekend ABQ 2017 before the early tickets are gone. I organize Start Up Weekends. I attend community leader retreats. I’m training to become an international Start Up Weekend facilitator. But I’m also a private sector employee and intrapreneur. I’m not the millennial in his parent’s basement playing and coding video games. I’m not the software engineer trying to find a team to build the next Uber for Airbnb for Facebook for Gen Z’ers. And neither are the people that attend Start Up Weekend ABQ. We’re community builders, parents, boomers, millennials and ideation specialists. We’re small business, veterans, students and entrepreneurs. The “who are these people” misconception may be the hurdle we need to jump in order to make Albuquerque the community we all want. Because “these people” are actually all of us. I took the Start Up Weekend concept to my company. We hosted a weekend event to work on an innovative approach to market ourselves. Our MVP (minimum viable product) became our marketing plan. We had some tough “war room” conversations. We stayed up late and came in early. We heard from our leaders and learned from our co-workers. We talked about new products over pizza and planned out office décor over coffee. We created an environment to harvest ideas. We created space and place to cultivate innovation. And most importantly, we took the time to work on ourselves and the people we surround ourselves with in order to make this place just a little bit better. So, whether you’re a tinkerer or an analyst; whether you’re a developer or a marketer, Start Up Weekend is about building a community and an environment to encourage entrepreneurial activity. It takes a community to build a community and we would love to have more on board. We’re excited to bring back Startup Weekend as one of the last big events for startups of all kinds in 2015. Startup Weekends in New Mexico have a very successful record of bringing great people together to validate and launch new ventures and we want anyone with skills and ideas about new business to participate! Andre Moore, who is a first time participant, is pitching an idea he’s had in the back of his head for a while. He loves cooking BBQ, and after getting feedback from family and friends who say his ribs are the best in town, he heard about Startup Weekend and decided to try it. Two other teams are hard at work as well, preparing for pitches and figuring out how to tell their story as they build a business: Local Quest, an online role playing game that seeks to connect gamers who are near each other, and Orderfy, a startup that’s focusing on closing the loop between ordering from a food truck and being notified when food is ready. Can we raise the visibility of Albuquerque’s startup community? Tweet your participation and support with #SWABQ – and see the results here. Top ten in the west? we can make it! Amazon Web Services: http://aws.amazon.com/activate/event/2014sw93sdn32 – Each attendee can visit this URL to redeem $100 in AWS credit! Make sure you do this before the end of the weekend, as the codes will expire. Free money! Register for free .CO domain registration by visiting www.go.co/startupweekend using and using the following code: SW14115685. This code is only applicable once per participant, and will only be active until the first Thursday following your event. Google Cloud Platform: is offering developers $300 in credit to build your web or mobile apps. Visit cloud.google.com/free-trial/ to get started. At the end of a long Global Entrepreneurship Week, Albuquerque Economic Development Director Gary Oppedahl spoke a bit softer than his usual self, but with no less conviction. As a constant and vocal champion for entrepreneurs, Oppedahl is a presence at nearly every startup event in the metro area, along with Eric Renz-Whitmore, one of main organizers of Startup Weekend Albuquerque. The 54-hour marathon of brainstorming, research, customer development, and pitching was kicked off last night with short and sweet speeches from both Oppedahl and Renz-Whitmore, along with a few words from locally grown entrepreneurs Travis Kellerman and Amanda Solosky. Kellerman talked about working across teams and disciplines, and a recent dive into managing the product / project process and coding. Solosky, one of the co-founders of Rival Theory — an artificial intelligence startup built entirely by University of New Mexico graduates —mentioned the difficulty of multiple pivots and the constant iterative process. The Kaufman Foundation’s Jon Robinson spoke for a couple of minutes as well, calling Albuquerque one of the most promising places he’s seen for entrepreneurship. “Albuquerque is a great place to start a company,” he said, and noted that the low cost of living and access to creative thinking are both competitive advantages that the city has in large amounts. With introductions out of the way, Startup Weekend facilitator Alexandra Ximenez loosened up the crowd of 50 or so people with a 5 minute exercise called Half Baked, where attendees had to pair random words into a product name and explain how the product worked and what problem it solved. After hearing about companies / products like “Opposable Sausages,” “Cold Coffee,” and “Automagical Symphony,” the room quickly relaxed, and Ximenez then ran through what to expect for the weekend…including pitching ideas, forming a team, market research, and customer development. Once groups were formed, ideas voted on, and everyone was ready to go, teams hunkered down to plan for the next couple of days. 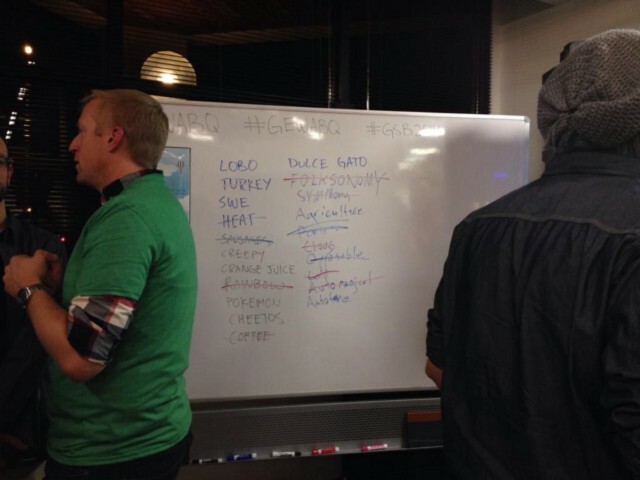 Follow Startup Weekend Albuquerque on Twitter via the #swabq hashtag, or keep tabs on our Twitter and Facebook pages. Being a first-time entrepreneur can be an intimidating thing, so having the opportunity to test your idea in a low risk, supportive environment over a weekend is fantastic. This is exactly what Startup Weekend is. It’s like a weekend test-drive of entrepreneurship and startups. It’s a place full of supportive, entrepreneurial people just like you, who are eager to create something. Over the course of 54 hours you will pitch ideas, form teams, validate your business, and share your new company with your peers and a panel of amazing judges. In one weekend you have the chance to share your idea with a group of like-minded people, this is your chance to inspire them, to gather people to your cause. Forming a team around your idea is the first step to a successful startup. Your team will bring valuable skills, supportive encouragement, experiences, and diverse perspectives to your fledgling business. Creating a startup not only requires a strong team but also a network of experienced mentors. Startup Weekend provides access to a broad range of mentors with diverse backgrounds and importantly, past startup experience. These mentors can coach you through many of the challenges you will face when bringing your vision to life. Creating relationships with these mentors will allow you to build a network that will be instrumental to your success. Every entrepreneur makes mistakes and the mentors who are available to you have all made their fair share. Learn from them and ask questions to accelerate your understanding and to help you launch your business more quickly and efficiently. Startup Weekend lasts for only 54 hours so there is a strong focus on two main aspects of your business. The first is customer validation. When you first form your team, you start with nothing more than an idea. If you want to have a successful company, it’s important to know if there are customers who will pay for the product or service you will be offering. This means you have to reach out to potential customers. Send them surveys, go interview them, talk with as many of them as possible. This information will not only help you understand if there is a legitimate market for you to serve but it will also help you refine your product to better meet the needs of your customers. The second focus during Startup Weekend is the pitch. Pitching your company is one of the most important things you will learn to do. There will be many times in the life of your business when you need to communicate what you do clearly and passionately. You might need to pitch to investors, employees, customers, or partners. As Startup Weekend comes to a close, you will be pitching to a panel of judges and to an audience of entrepreneurs, friends, and your fellow Startup Weekend teams. Practice your pitch, ask your mentors and teammates for feedback, and iterate. Your business is important, you’re solving a problem and you need to use your pitch to inspire others to join you, whether that means as investors, employees, or customers, help us understand your passion. When the weekend is over, maybe you’ll have a new business, something that you might eventually come to focus on full time. Or maybe you’ll decide that your own startup isn’t the right move. One thing is certain though…you will come away from Startup Weekend with an incredibly valuable set of skills, a new network of amazing entrepreneurial friends, and a fresh view of the world. Startup Weekend has helped create companies, careers, and communities all over the planet. You too can be a part of it. What will you start at Startup Weekend?